Growing up in Springfield, MO, Jay Kenneth Johnson attended Baptist church every Sunday, and always imagined he would be working a normal desk job someday. Less than two years and four different majors into his college career at Southwest Missouri State, he dropped out and moved to Los Angeles against his parents’ wishes. After only seven months in California and a short stint as Brendan on Y&R, Johnson landed the role of Philip Kiriakis on DAYS OF OUR LIVES. Johnson was also in the running to replace Jonathan Jackson (Lucky) on GENERAL HOSPITAL, but DAYS offered him a contract first. He grew up watching DAYS with his grandparents, so he was thrilled to join the cast, and even a little starstruck. “I was walking down the hall and saw Joe Mascolo (Stefano) and Kristian [Alfonso, Hope]. I had been watching them for 10 or 15 years. It was so wild!” he says about one of his first days on the set. Johnson’s character, Philip, was surprisingly beloved by fans. His spoiled rich kid persona didn’t deter fans from flooding Johnson with love letters and marriage proposals. Philip’s relationship with Chloe (“Phloe”) was a big hit, but their love was foiled when Brady Black interfered. In 2002, Johnson left DAYS to pursue prime-time, and did so on FOX’s drama NORTH SHORE. While shooting the series, Johnson lived on the beach in Waikiki. He never ruled out the possibility of returning to DAYS, which he did after four years. In 2006, Philip returned a new man (with a new face) determined to get his daughter back. “He’s definitely got some anger management issues… I attribute it to everything he’s been through. He lost his leg. He got his face blown off. His daughter was taken from him.” Viewers are trying to get used to the new, angry Philip, but Johnson is enjoying and embracing the challenge. Originally auditioned for the role of Brady, but was cast as Philip instead. Grew up in the same Missouri town as Brad Pitt, just around the corner from one another. DAYS fans were so heartbroken when he left the show in 2006 that they hired a plane trailing a "Good Luck" banner to fly over the studio on his last day. Off-screen, he is the polar opposite of Philip. His friends even say he's "too nice," and he agrees. In his spare time, he is the lead singer in the band Solid Jones. Salem alums Jay Kenneth Johnson (ex-Philip) and Martha Madison (ex-Belle) are featured in the TV-movie, UNDERCOVER BRIDE, airing Sunday, April 15 on The Hallmark Channel. 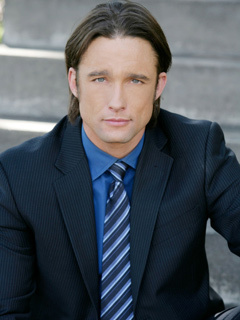 It's hard to believe it's been a decade since Jay Kenneth Johnson took over the role of DAYS OF OUR LIVES's Philip Kiriakis. Philip started out as a spoiled, rich high school kid, but ultimately emerged into a smooth, suave ladies' man with a serious head for business. Johnson reflects on his fondest memories from his years in the Salem fold.